I'm just going to get this out of the way upfront. Twilight is the book that made me discover there was a young adult section in the bookstore. I had NO idea! I'm not even kidding. I grew up reading romance novels, and never knew there was a genre devoted to me. But oh, I loved Edward. :) Oh, and random fact... this is actually the first book I added to Goodreads when I joined. Crazy! Did anyone else read the Avon True Romance series? There were, like, 13-14 books aimed towards young adults in this series, all written by well-known authors like Meg Cabot, Beverly Jenkins, etc. This one was my favorite on, though. And thus began my love of pirate romances. I swear, I have this crazy guilty pleasure. I cried, duh. But I really loved this story. And I think it might just be the least sad book by Mr. Sparks. My first time travel book! I LOVE Lynn's romances. They are soooooo sweet, and so amazing. I just love Scotland, too, and most of her books take place there. This book is full of awesome. The writing is lovely, and the story is so unique! Just read it, I tell you. This book starts when a woman gets kissed by a mysterious man in a Zorro mask on New Year's Eve. Who is he!?!?! Oh, I loved this book. I was SOOOO scared of this book. It took me forever to be ok with it, and my mom thought I was insane for wanting it. I LOVE THIS BOOK. Seriously, this solidified my love of YA novels. "Werewolves? Seriously? I love Edward, not Jacob, so I am going to hate this." People, Shiver trumped Twilight. No questions asked. This was a big deal for me!! Yes, I reviewed this here (my first review ever, actually! ), but I actually had to re-read the book in order to remember it enough to write a review. So it counts. My first chick-lit! I loved it!!!!! Wow. My reading choices and habits have changed so much since I became a blogger! It's insane! Look at all my adult romances on this list! I hardly ever get to read them anymore! Anyway, what amazing books did you read before you blogged, and maybe don't have a review posted? Let me know, and I'll come check it out! Yes!! Shiver - thank you. Absolutely agree. Also - The Hourglass Door sounds intriguing … excuse me while I run off to add it to my TBR list! I've never read "With Every Breath" but it sounds really good! I'll have to check that one out. I like Karen Hawkins; I'll have to check out Catherine and the Pirate. Glad I'm not the only one with a mix of various genres! I felt the same way about The Hunger Games. It creeped me out SOOO much! The Guardian! I should have included that in my list too, haha! I've been eyeing Shiver for a while now.....maybe I need to pick it up. I only read the Hunger Games books earlier this year - so I'd already seen the movie, and I almost never watch the movie before reading the book. Kinda late to the bandwagon, but I loved them, and I also love having Jennifer Lawrence and Josh Hutcherson and the rest as my mental pictures for Katniss and co.
Great list - I only remembered that I read Twilight before I started blogging when I read your list. I'd have loved to have included Shiver and The Hunger Games on my list, but unfortunately read them after I started blogging. I feel like, no matter whether people like to admit it or not, Twilight holds a special place in most people's hearts. Twilight pretty much introduced me to the YA section too. Great list! I need to check out Mary Higgins Clark. I am adding Shiver to my list as well. Thanks for sharing and have a great week! The Hunger Games! I read it after having a YA hiatus and it reminded me how good YA books can be. I really want to read Catherine and the Pirate. I have never read a Pirate Romance story before but I am more than willing to start now. You have some good ones up there! My top ten has actually not changed that much, except for adding THG! This was actually quite easy for me since I only started blogging a month ago! But glad to see Shiver on there. I own it but haven't started reading it yet so it's always nice to see positive things about it. Gets me excited to start reading it. I listed Twilight as my #1 choice as well. I wouldn't be a book blogger if it weren't for that series. I would have listed the Hunger Games, but I was a little late to start reading that series. I was already bloggig by the time I started reading it. There is sure a lot of people joining today. I have a copy of Shiver... You're making me want to read it asap. Another Twilight fan here. Just like Julie, I hadn't even wandered into the YA section until I found this book (and I haven't left the section since). I haven't read ANY of those! Wooo some really good choices here! Loved "The Hourglass Door" and Lynn Kurland is one of my favorites! She's got a fantasy series that's really good. Great list! I dont know most of them but I too loved Shiver! I haven't read a MH-C book in forever, but I used to read them like crazy!! She's one of the best mystery writers of all-time. Sadly, I have to agree with Twilight. It definitely won't go down as a favorite book of mine (or series), but it did encourage me to keep reading more and more. And OF COURSE to The Hunger Games. How on earth did I forget those?! I've noticed some changes to my reading habits since I began blogging, too. Loved The Hunger Games. I've seen the last Twilight movie, but I've never read the books. I want to go back and do that. Twilight was the book that got me into YA too. Seems it's a popular choice. :) Have a few more books I now want to check out, having read your list! I also have Twilight. Go figure?! :) Good list! Twilight was also on my list and several others I have read. But you had a few that I want to look into now. I love your list! Yes, I think Twilight was a lot of people's gateway into YA. It's what made me realize that there WAS a YA section, and that half of the books I read were in it already! My sister was also scared of The Hunger Games, and I think that's what intrigued me about the series. SO INTENSE! Oh, I did like AUSTENLAND quite a lot - I had a pretty solid Jane Austen spin-off period during my college years. Thanks for sharing your list! Twilight was definitely what open my eyes to YA books. I had no clue they existed before that. Hunger Games! I like Twilight when I read it, but going through the series I kind of fell out of love with it, even though I really enjoyed Breaking Dawn. They're really entertaining books, and I agree that they turned a lot of teens into readers, which is awesome. I still read the genres of the books I listed--I just read more broadly now. Shiver is on my list, too! Though I preferred Catching Fire over the original Hunger Games novel. And Mockingjay was the scariest of them all! This list was so much fun! Thanks for the post. This list was so much fun! Thank you for the post. This is a wonderful idea! I'm torn between going back and completing brilliant old ones or just doing this every week from now on! Also, bravo with putting down Twilight. Proud choice. Those books DID get kids reading, so they aren't all bad. Hunger Games and Shiver definitely! Twilight... erm... ;) Mind you, I have the Da Vinci Code on my list, so who am I to talk?! Haven't heard of so many... Man, it's going to take a while to trawl through these top 10s and add to my Goodreads WTR shelf. Love this feature. My first shot at it but I'm hoping to do more. Thanks for setting this up! Yay! 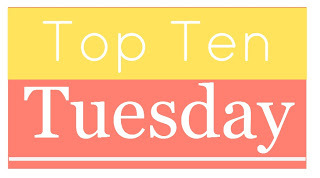 This is my first ever linkup with Top Ten Tuesday (after MONTHS of enjoying it on my favorite blogs) and I'm so excited to be a part of it! I read Twilight in less than a day, no lie. Same with me! New Moon was not the best, Eclipse picked things back up, and feel like Breaking Dawn was the last nail in the coffin. I was a naive reader before blogging and so my memories are waiting for the new Mary Higgins Clark book to come out and buying it, so every year that was my favourite book and sometimes my only one. I could copy and paste this and add it to my list here! I hardly read anything when I was younger. Sometimes the new MHC book was the only one I read all year. Crazy! Twilight introduced me to YA to!! Since then it has taken over my reading habits, lol. Loved Hunger Games too! & I own Shiver and it's been on my TBR for a while. Since you saw it triumphed twilight I think I am gonna have to definitely read now and soon! Lynn Kurland is one of the few Romance category authors I will read, along with Christina Dodd, Teresa Medeiros, Iris Johansen and Diana Gabladon. I did pick up the Tilight boxed set, but never read it. I wonder if I will now that I've seen the movies. The books are WAY better. Especially Twilight. I felt like that movie was laughable. You should give the books a try, especially since you already have them! I started blogging in 2009 because I wanted to record and share my experiences with the many great novels I had been reading. Pre-blogging books include Cloud Atlas (still my all time favourite), Wild Swans, The Historian, A Beautiful Mind, Angela's Ashes, Seven Types of Ambiguity etc. Since starting my book blog my reading tastes and experiences have broadened dramatically. While literature remains my favourite, these days there are very few genres I have not or will not try. Linked up! (: One book I wish I had read before becoming a blogger is Coraline- I wish wish wish I had heard of it and picked it up, but unfortunately I didn't read it until last year. Linked! I went with Top Ten Books I'd Hand to Someone Who Says they Don't Like to Read! Linked :) Went for- Top Ten Books That Made Me Cry!